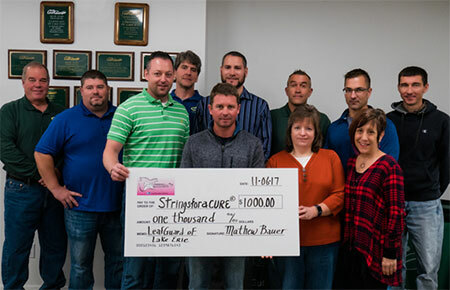 StringsforaCURE raised $26,500 during its 2018 Pickin’ on Cancer Program Sponsorship drive. The funds raised during this annual campaign go directly to supporting its programs that provide education, comfort, financial assistance and emotional support directly to breast cancer patients. StringsforaCURE Board members were on hand to personally thank its top donors to the campaign who donated $1,000 or more. (L-R) Donna Rose Sherrange, SFAC Secretary, Elisa Guida, SFAC Founder and Executive Director, Chris Larson, Patti Larson, SFAC Chairperson and Treasurer, Matt Bauer, President LeafGuard of Lake Erie, Inc, Chicaga Bauer, Peg Tuttle and Sara Mead. Not pictured are Rick Clark, John and Loretta Clark, Joe Kavlick, Vice President, Interim Healthcare, a representative from Circolo Nazionale Lodge 122 and a donor who wishes to remain anonymous. Interim Healthcare supports StringsforaCURE with a Program Sponsorship of $1500 for their 2018 Pickin’ On Cancer. The donation will be used to help fund StringsforaCURE’s programs which provide financial assistance and emotional support directly to breast cancer patients. On hand for the check presentation were (L-R) Brigid Farr, Transitional Care Coordinator, Joe Kavlick, Vice President, and Elisa Guida, Founder of StringsforaCURE. The Zone Dance Club held their 13th annual Breast Cancer fundraiser on October 12th, 13th and 14th. During their Pink Party Weekend, The Zone along with Sam‘s Club raised over $4,000 to benefit the StringsforaCURE Foundation. Over the past 6 years they have raised over $19,400 for StringsforaCURE. The money raised from this fundraiser goes directly to breast cancer patients through the StringsforaCURE Gift Card, Medical and Living Expense grant programs. Pictured are (L-R) Brenda Berchtold, StringsforaCURE Patient Advocate, Gracie Watson, Michael Watson and Elisa Guida, StringsforaCURE Founder. Michael and Michelle Klemm once again organized their 5th Annual “Take a Bite out of Cancer” golf tournament that took place on August 25, 2018 at Green Meadows Golf Course. Their event raised $4,000 for the StringsforaCURE® Foundation. The money raised will be used to provide financial assistance and emotional support directly to breast cancer patients when they need it the most. L-R: Michelle Klemm, Michael Klemm, Abby Klemm, Catherine Datte, StringsforaCURE Board Member, and Elisa Guida, StringsforaCURE Founder. On Monday, June 18, 2018, Ambridge Rose Spa and Salon presented the StringsforaCURE Foundation with $500 that was collected during the last few months through Fantasy Hair Extensions offered by the salon as well as donations made by staff and clients of the salon. Three generations of “Giving Back” to the breast cancer community are pictured: Char Szymanowski (second from left), mother of Rose Cortes (left), owner Ambridge Rose Spa and Salon and Rose’s daughter, Karle Cortes (third from left) along with Elisa Guida, Founder and Executive Director of the StringsforaCURE Foundation. The money raised will go directly to breast cancer patients by helping to fund our Gift Card, Medical Assistance and Living Expense Grant programs. BeBalanced Hormone Weight Loss Center in Erie, PA raised funds for StringsforaCURE by donating 10% of new sales of their BeBalanced Hormone Weight Loss program to StringsforaCURE® during the month of March 2018. Pictured L-R are Denise Horton, BeBalanced Owner, Brenda Berchtold, SFAC Board Member, Mary Kay Shigo, Natural Hormone Balancing Specialist, and Elisa Guida, SFAC Founder and Executive Director. The money received will be used to fund the StringsforaCURE Medical Assistance, Living Expense and Gift Card Grant programs that provide financial assistance directly to breast cancer patients. On Sunday, March 4, La Nuova Aurora Society awarded a total of $71,000 to numerous local charities. The money that they donated was raised through their small games of chance. This is the 4th year that StringsforaCURE® has been one of the charities to benefit from their generosity. Pictured are (L-R) Patti Larson, Development Director and Treasurer, Elisa Guida Founder and Executive Director, Ed Saloum, IT Specialist, and Donna Rose Sherrange, Board Secretary, who were on hand to thank Tony DeDad, President of La Nuova Aurora Society for their generous donation. The funds received will be used for StringsforaCURE programs that provide financial assistance directly to breast cancer patients. Interim Healthcare presented StringsforaCURE® with a check for $1500 for their Pickin’ On Cancer campaign in support of StringsforaCURE®’s programs that provide financial assistance and emotional support directly to breast cancer patients. On hand for the check presentation were from left, Mary Beth Lombardi, Marketing Liaison, Joe Kavlick-Vice President, Brigid Farr, Transitional Care Coordinator and Elisa Guida- founder of StringsforaCURE®. The Zone Dance Club held their 12th annual Breast Cancer fundraiser on October 13th, 14th and 15th. They raised a total of $3,900 to benefit the StringsforaCURE® Foundation. Over the past 5 years they have raised over $15,000 for StringsforaCURE®. The money raised from this fundraiser goes directly to breast cancer patients through their Gift Card, Medical and Living Expense grant programs. Pictured are (L-R) Michael Watson, Rose Palombi, Gracie Watson and Elisa Guida, SFAC Founder. Connoisseur Media held their Charity Classic Golf Tournament at the Beechwood Golf Course on August 11, 2017. Despite the rainy weather in the afternoon, the tournament raised money that was presented to StringsforaCURE® at the dinner following the event. StringsforaCURE® Board Members, Donna Rose Sherrange and Patti Larson, were on hand to accept the check for $1,200 presented on behalf of Connoisseur Media by Rocket 101’s Morning Show co-host Mojo McKay. These funds will be used to provide financial assistance directly to breast cancer patients through the many programs offered by StringsforaCURE®. Pictured: L-R: Tony DeDad, Donna Rose Sherrange, Elisa Guida, Nicole Brugger, Patti Larson, Brenda Berchtold and top row: Richard Vendetti. The StringsforaCURE Board thanks the Nuova Aurora Society for their generous donation. On Sunday 3/5/17 Nuova Aurora awarded a total of $75,000 among 49 local charities. They raise money through their games of chance and this is the 4th year that StringsforaCURE has been one of the charities to benefit from their donation. These funds will go towards our Programs that help breast cancer patients. The donation from UPMC Health Plan helped StringsforaCURE surpass their goal of raising $25,000 for their annual Pickin’ On Cancer Fundraiser. Jenny Weigold Geertson, Senior Manager, Community Relations for UPMC Health Plan presents a check for $1,500 to Elisa Guida, Founder and Executive Director of the StringsforaCURE Foundation. The generosity from the community and supports of StringsforaCURE enables the foundation toc continue to provide assistance directly to breast cancer patients through their Gift Card, Medical and Living Expense grants programs. Lakeview Wine Cellars located in North East, PA and owned by Sam and Becky Best donated a dollar from each bottle of their specialty wine, “Cavitation” that was sold last fall to StringsforaCURE. They presented a check for a total of $150 to StringsforaCURE board Members. Pictured (L-R) are Sam Best, Becky Best, Donna Rose Sherrange, SFAC Board Secretary, and Patti Larson, SFAC Development Director and Board Treasurer. The money raised will be used to help breast cancer patients directly through the many programs offered by the StringsforaCURE Foundation. The UPMC Hamot Emergency Department raised funds for the StringsforaCURE Foundation by selling Breast Cancer Awareness T-Shirts during the month of October 2016. It is through the generous support from the community that StringsforaCURE is able to continue to fund its Gift Card, Medical Grant and Living Expense Grant programs, all of which provide financial assistance directly to breast cancer patients. Pictured in the back row: Stephanie McElhaney, Kimberly Dutton, and Rachel Phillips and in the front row: Sue Dombrowski, Elisa Guida, SFAC Founder and Executive Director, Tammie Freeland, Christina Sargent. The McDowell Lacrosse team raised $5,100 for the StringsforaCURE foundation during its “Stick It To Cancer game on April 22, 2016 between McDowell High School and Cathedral Prep. The money raised will be used to continue funding StringsforaCURE Gift Card, Medical Grant and Living Expense Grant programs, all of which provide financial assistance directly to breast cancer patients. Pictured from left to right are Assistant Coach Andrew Wagner, student athletes and members of the McDowell JV and Varsity Lacrosse team, Head Coach Sean Stutzman and Elisa Guida, SFAC Founder and Executive Director and graduate, Matt Parry. The 2nd Annual Bra Crawl hosted by Rocket 101 was held on Friday, October 21, 2016. The Bra Crawl started at The Brewerie and moved on to Lavery Brewing, Arena Sports Bar, Voodoo Brewery and ended at Sherlock’s. The money was raised through T-Shirt sales and registration fees for each participating bar. Participants were asked to wear a “blinged” bra to the event and the winner of the best “Blinged” bar received a guitar string pendant made out of Jeff Pilson of Foreigner recycled strings. This donation will be used to continue funding the StringsforaCURE Gift Card program, which provides $100 Gift Cards to breast cancer patients. Pictured from left to right are Rocket 101 DJ Mojo McKay, Elisa Guida, SFAC Founder and Executive Director and Rocket 101 DJ Allan Carpenter. StringsforaCURE would like to thank Rocket 101 and all of our supporters who came out on Friday October 21st for the 2nd annual Bra Crawl. We would also like to thank the Brewerie at Union Station, Lavery Brewing Co., Arena Sports Bar, Voodoo Brewery and Sherlocks Park Place for Sponsoring this event. Without your support, this fundraiser would not have taken place. Local musician Boyd Baker spends summers in his hometown of Erie, PA. During the summer of 2016 he decided to donate all of his tips to StringsforaCURE and raised $470 for breast cancer patients. These funds will to to providing $100 gas, grocery and pharmacy gift cards directly to these patients. Thank Boyd! You ROCK! 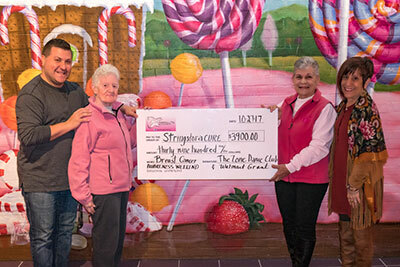 For the fourth year in a row, the StringsforaCURE Foundation was the beneficiary of the funds raised at the 11th Annual Breast Cancer Weekend at the Zone, that took place Sept 30 – Oct. 2, 2016. The event directly raised $2,779 and Sam’s Club Jamestown awarded a $2,500 grant to StringsforaCURE, bringing the total to $5279.00. Gracie, a breast cancer survivor, is Michael’s mother and his inspiration for these Breast Cancer weekends. Owner Rose Cortes and her mom Char are quite the advocates for StringsforaCURE. For the past few years, during the month of October, they will sell pink hair extensions and donate a portion of the proceeds to StringsforaCURE. SFAC also teams up with Char and provides Comfort Baskets to breast cancer patients. We count on community support like this in order for us to continue with our mission, providing financial and emotional help directly to these patients. Jim and Amy Feronti hosted the Pink Party on Friday May 20, 2016. This year the StringsforaCURE Foundation was the beneficiary of this fundrasier which raised $4,780. Jim & Amy have been hosting these parties for several years in memory of Jim’s mom Sandra Feronti, who lost her battle with breast cancer many years ago. Gannon University wrestling coach Don Henery and his friend Jennifer are pictured on the right. For the past four years Bill Kern and Bob Dartnell have combined their love for music with fundraising for StringforaCURE. Dart and Elisa have known each other for years, ever since their childhood days in Drexel Hill, PA The first Bill n Bob Fest was so successful that they had to move it to the Fairview Legion. Local musicians gather for a fun filled day of singing and playing. This year (2016) the festival raised $7,000 for SFAC. Bill Kern is in the blue overalls to the left and Bob (Dart) is in the yellow shirt on the right.